Domain name suggestions may help jumpstart an online business or personal website. brainstorming business names or thinking of appropriate keyword rich domain names can be tough as well as tedious. Even sometimes using a domain name generator tool can be painful and time consuming. 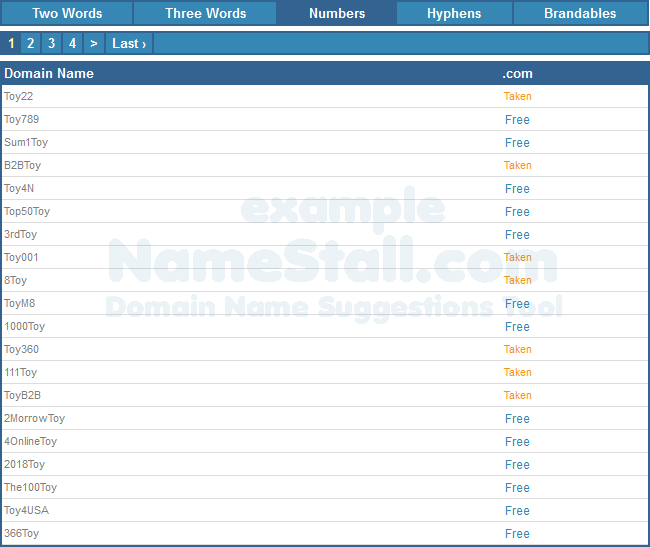 However, if you just need ideas for domains or website names then our tool is the one all you need. You can browse through thousands of available and unregistered excellent domains using this amazing tool. Or, maybe you can find one that is right for you or maybe viewing our suggestions will help spark your own domain name ideas. Our domain name suggestions are useful for those who are familiar with online and internet marketing as well as for people who are new to the game of domains or online businesses. In fact, one of the best advantages of viewing our domain suggestions is that you can choose from a variety of strategies depending on your goals or website or business criteria. All you really need to do is write the word that describes your website or company in the keyword field and then just hit the �Suggest Name� button and browse the list of our suggested names to find which ones work for you best. List will contain keyword rich two words suggestions (e.g. KeywordRick.com), three words suggestions (e.g. KeywordRickDomain.com), suggestions with hyphens (e.g. Keyword-Rich.com), domain ideas with numbers (e.g. 100Keywords.com) as well as brandable domain names (e.g. Keywordolar.com). If you are lucky, our brandable domains might even contain some single word domains. These are some of the best and most valuable domain names to own. Let us explain how to utilize our wonderful website name suggestions script. Say you need a website name for your new toy company and your most important keyword is �Toy�. 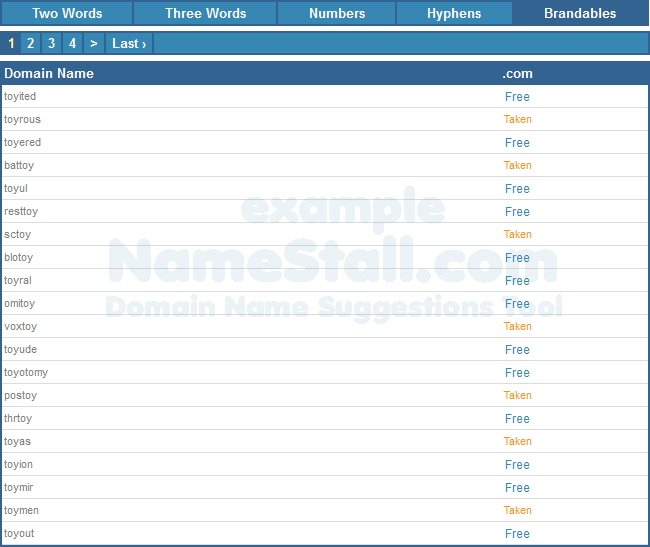 Now all you have to do is just write the keyword in the keyword field then simply hit �Suggest Name� button. NameStall�s domain name ideas will provide a huge list of two words website names like � ToyZone, ToyPlace, YourToy etc. An example is given below. A list of three words ideas like � OnlineToyShop, BuyBestToy, ToyForSale etc. An example of three words suggestion is given below. Names with numbers like � 123Toy, Toy24, Toy4You etc. Example of suggestions with numbers. Suggestions with hyphens like � Best-Toy, Toy-Box, Toy-Boy etc. An example in the image. And brandable domains like emitoy, toylar, toyoly etc. An example of brandable suggestions is given below in the image. Amazing! But It doesn�t stop here. It will search availability of all domain names in 4 different TLDs of your choice at once. Can you see our free domain suggestion script is very convenient and best around? It provides thousands of generic, meaningful, short and brand able domain names for you. From where, you might find the name you have always been looking for. Or, maybe it will jumpstart your own creative process and led you to a different domain name altogether. The possibilities really are endless with free domain name suggestions. 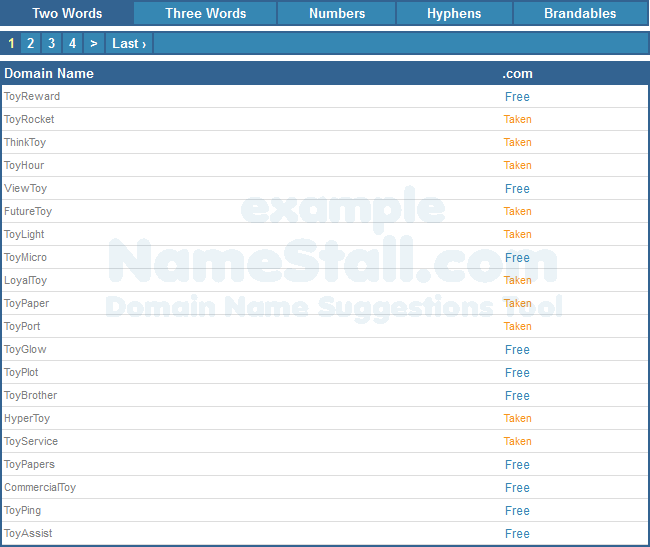 If our suggestions and ideas can�t satisfy you or you need more sophisticated naming tools, you may try our free brand name generator, high paying keywords domain search or instant domain checker tools to find a domain name. Use best domain name suggestion wizard and generator today to get a cool domain name to jumpstart your online website or business.